I’ve always been intrigued to see restaurants with wide open display glasses to showcase their chefs bustling in their cooking space. 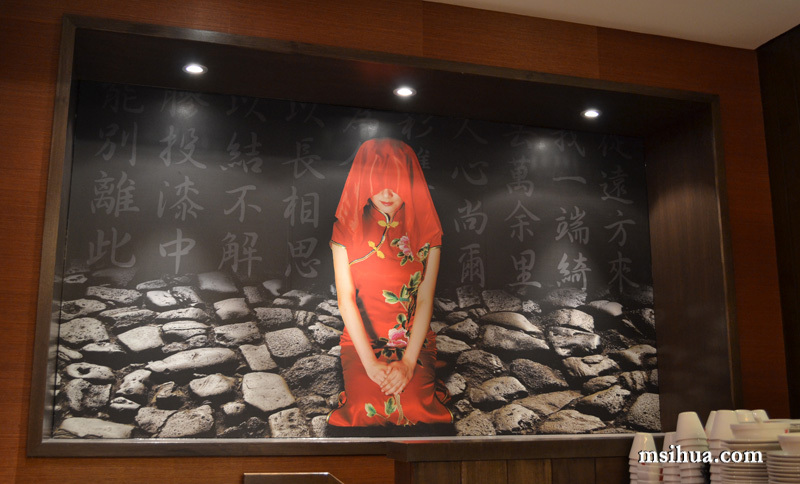 So when I heard that the baby sister of Hutong had been set-up in the recently restored and renovated Mid City Arcade (Old Village Cinemas), I was instantly intrigued! 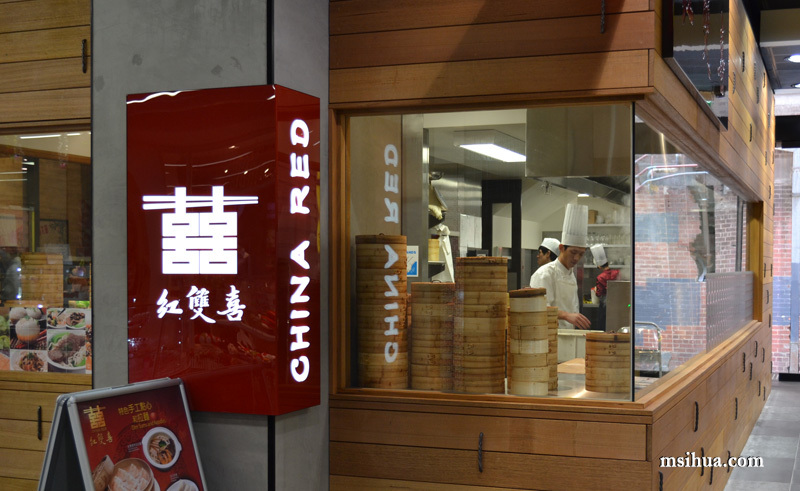 So, off we went to China Red to see what they had to offer… on 3 separate occasions! 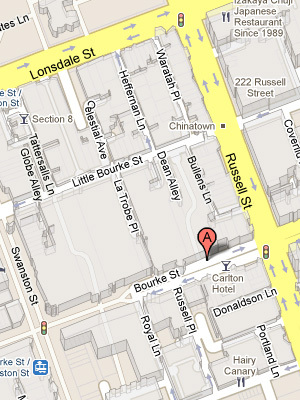 Obviously, knowing the association China Red has with Hutong, we came with high expectations in placing our orders. 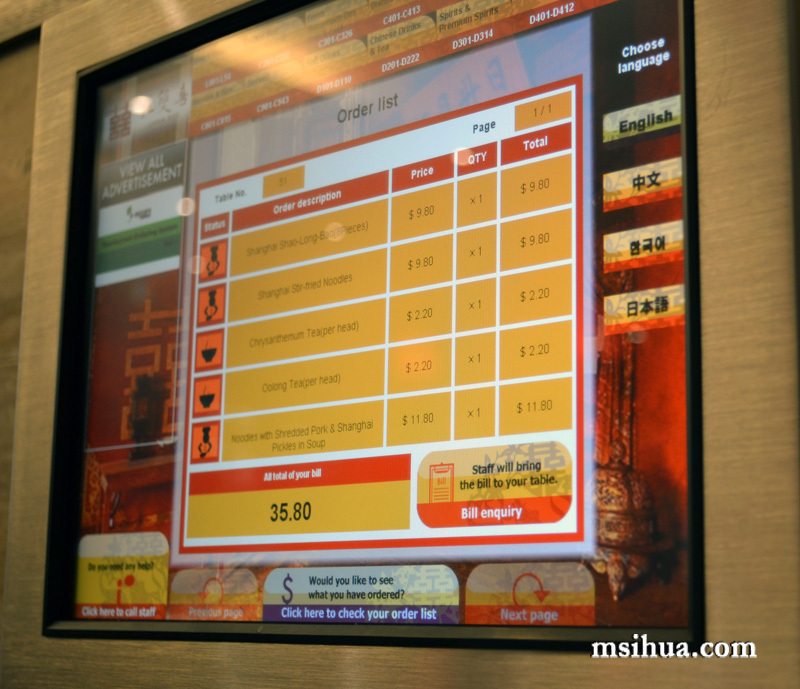 More so when placing our order of Xiao Long Bao ($9.80). So the little dumplings of happiness arrived pretty quick (it was a Sunday) after confirming our order. That being the first dish to be served up, I was having a slight anxiety attack over the next two dishes we had placed. On my first visit here, I was not feeling too well, and the Boy insisted that I order a noodle soup dish. 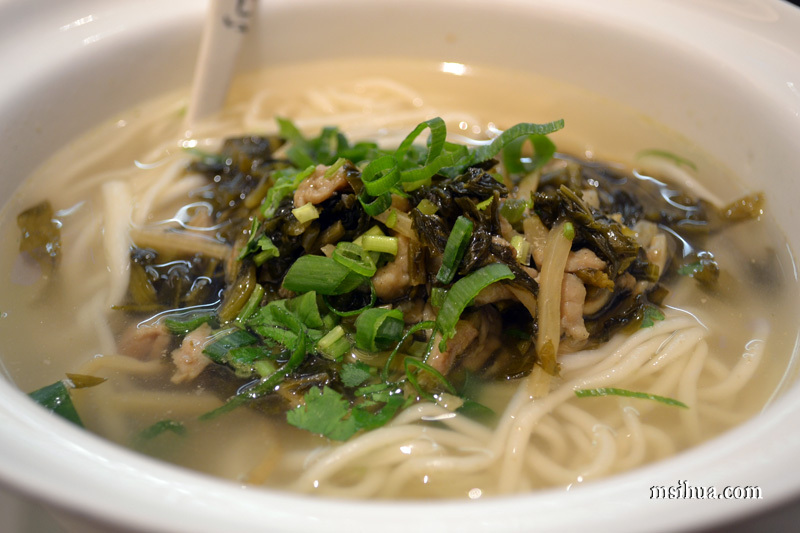 And so I ordered the Noodles with shredded pork and Shanghai pickles in soup ($11.80). After the sad introduction to China Red with the dumpling dish, I approached this dish with slight trepidation, and I was pleasantly surprised! The broth was clear and not to heavy. Clean and fresh. The freshly hand made noodles were deliciously smooth and springy. The Boy had ordered the Shanghai stir fried noodles ($9.80) and unlike myself, could only stomach less than half the plate. He said it didn’t taste right and the noodles were clangy (tasted like the store bought packet variety). 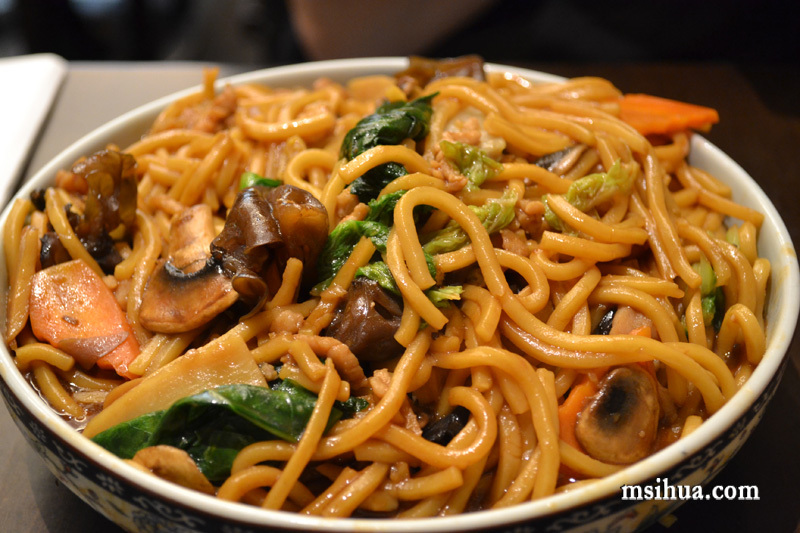 Unfortunately, I have to say what sort of Chinese restaurant messes up Shanghai Noodles???!!! Isn’t it a simple basic stir-fry noodle? Oh my… but it could be a one-off case where they might’ve misjudged the seasoning or sauces required. Despite my initial misgivings, I allowed myself to think of the positive. 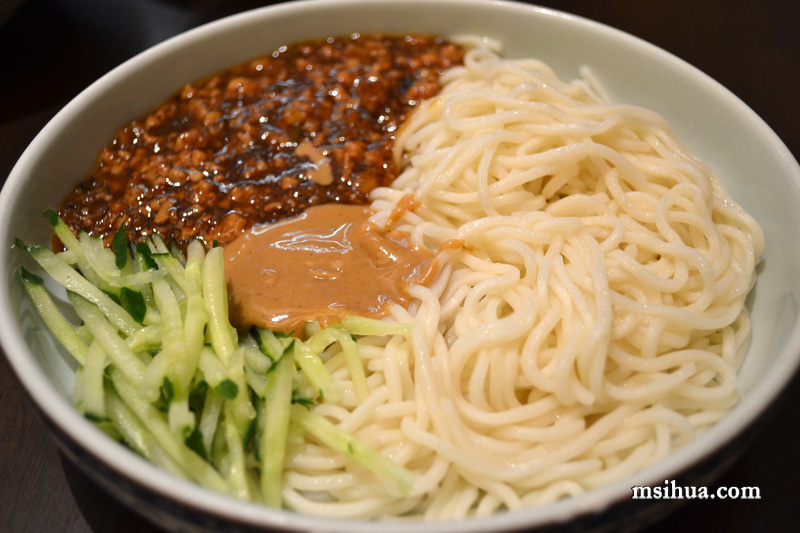 In this case, the hand-made noodles. So when we were next in the area, I convinced the Boy to give China Red a second chance. Whilst I played it safe by ordering the same noodle soup as before (just as good as I remembered), the Boy decided to go with the Peking noodles with meat sauce ($11.80). And thank goodness! He liked it! I had my fingers crossed the whole time (in case the Boy tore me apart!). In terms of this dish, the peanut-like-sauce made an interesting combination of taste with the meat sauce. It was somewhat addictive. On my third visit there, I brought along Miss S (soon to be Mrs) for lunch on a Friday. The soup was heavy in pepper and the venison was well cooked. The noodles, just as smooth and silky as before. So what do I think of China Red now? Certainly there has been a few hit and miss with some dishes. 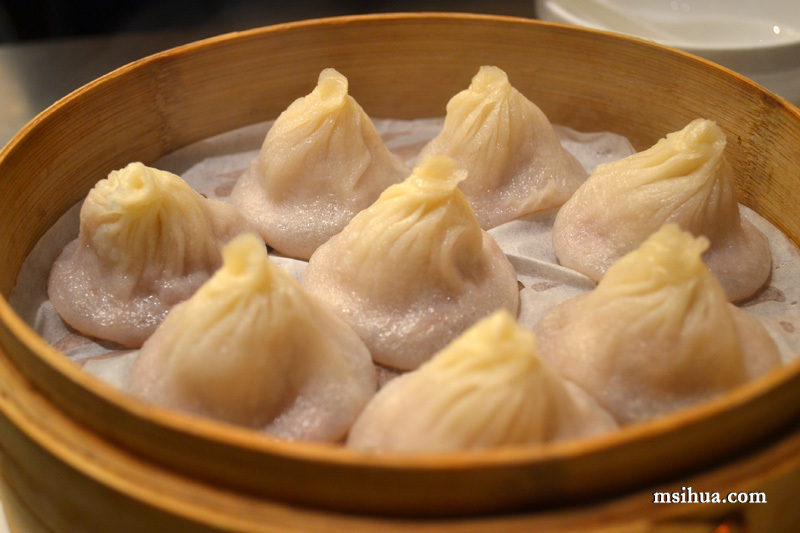 For dumplings, certainly Hutong is better. However, if you happen to be around the area and want some good freshly hand-made noodles, then I will highly recommend this place. We have yet to try any of the main dishes, so maybe next time. Oh yes, I find the number of times mango appears on the menu amusing as well! Plus now they have that colourful menu with a dozen graphics of mango desserts in their different incarnations! I have to give the noodle soups another try. I usually have dishes there. Love their dried chilli soft shell crab! It’s so funny isn’t it! We even tried counting them, but it was endless!!! The noodle soup looks good, I might try that when I have a need a bowl of something cleansing. Actually, I’ll prob check it out today after work! Yeah… sometimes I just want something non greasy at all! 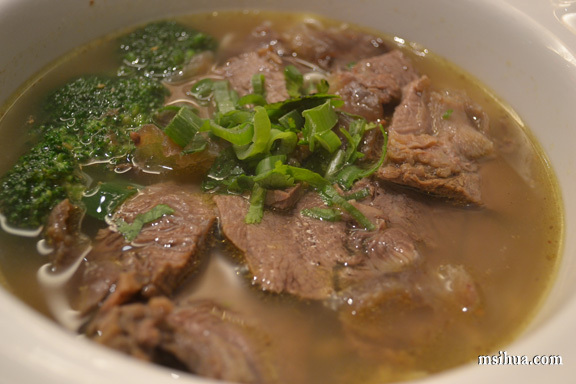 I’d like to try out the Peking meat dish and the soup noodles… my first experience at Hutong was memorable (in a good way) so will give this a try soon… cheers for the review :). Yep, I definitely only come here for the noodles. That is all. Dumplings are too hit and miss, even the won tons in chilli sauce vary a lot.